Like most brides on their wedding day, you no doubt were filled with love for your husband and the hope of a happy life together. But perhaps today, as the realities of life together have settled in, those happy expectations are going unfulfilled. And it's tempting to think, "If only my husband would change, I'd be happy." If you desire to rekindle the love and hope you felt on your wedding day, this book will go a long way toward making that dream come true. Contains discussion questions and personal reflections at the end of each chapter. Rhonda Stoppe is the No Regrets Woman. She is an author and speaker dedicated to helping women live life with no regrets. 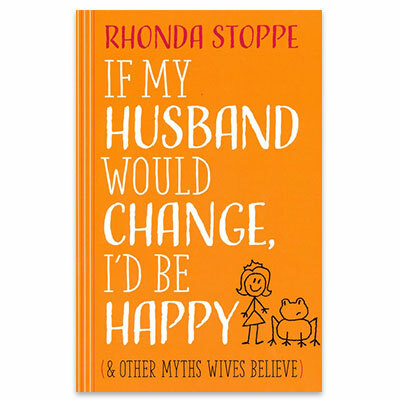 With more than 20 years’ experience as a mom, mentor, and pastor’s wife, Rhonda’s wisdom and experience helps women discover significance in God and His specific purpose for their lives, connect biblical principles to everyday decisions, develop a loving marriage that others dream about, and influence the next generation by raising children with integrity.